Cucumber plants are a warm-weather vining vegetable that cannot tolerate even a light frost. Because of their preference for warmer temperatures, cucumber plants can grow very quickly, and the fruit can become overripe in a short period of time. Cucumbers need to be harvested as soon as they are ripe to avoid over-ripening on the vine. When cucumbers are left on the vine for even a day or two after they have fully ripened, they will quickly exhibit symptoms of over-ripening. Cucumbers will turn yellow in spots, which will eventually turn orange in color. The fruit will continue growing larger, but the fruit will also become less firm. The color change will progress until the fruit is entirely orange. The cucumber’s skin will eventually develop cracks if it is left on the vine for too long. The size of a ripe cucumber depends largely on the variety of cucumber you have planted and the growing conditions. If your cucumber plant is a long slicing cucumber variety, it can grow to 12 to 15 inches long. Check the seed packet or the seedling information card to determine the average size of your cucumber. Ripe cucumbers should be firm to the touch, with a slight bounce to them when you squeeze them gently. Ripe cucumbers are an even shade of dark green and are smooth-skinned with no cracks. Cucumbers are mostly early harvest plants, which means that they will produce fruit ready for harvest fewer than 60 days after transplant. In the cases of heirloom variety cucumbers such as the "Marketmore 76," the days to maturity will be longer. The Marketmore 76 takes up to 68 days from the date of transplant before any of the cucumbers can be harvested. 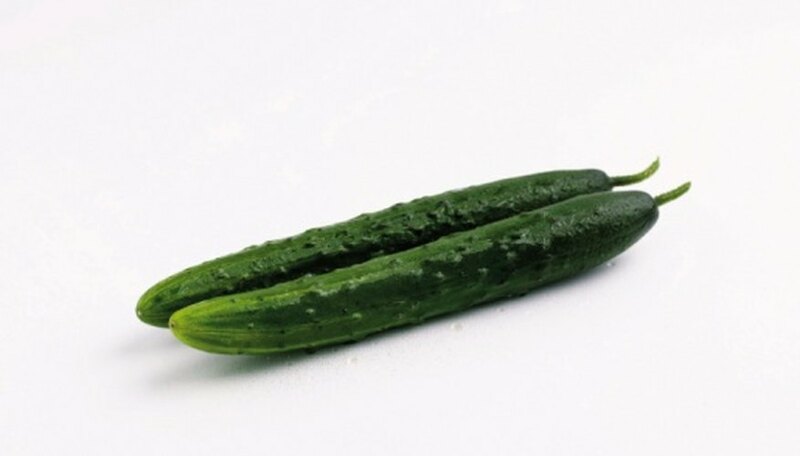 Overripe cucumbers can be left on the vine so that they fully mature into seed cucumbers. Saving one or two of your cucumbers as seed cucumbers is a cost-effective way to save seeds for next year's garden. Allow your cucumber to remain on the vine until it is completely orange. Harvest the cucumber once it is fully orange and slightly cracked. The more mature the cucumber, the better the seeds for growing.